Curio Dance. Nov. 5, 2011. As a professional choreographic team trained in the styles of modern, contemporary, and traditional dance forms. Giselle Mejia graduated with a BFA from SUNY Purchase College and Dario Mejia from The Julliard School. Giselle is a teaching artist with the Cowles Center for Dance and Performing Arts, and Dario an avid dance instructor around the metro area, both heighten enrollment in the facilities they teach. 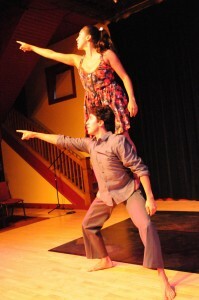 The siblings formed Curio Dance in January of 2009 with a premiere evening length duo performance. Since then, they have aired on MN Original, and have been highlighted in a documentary of Latino voices in Minnesota, among multiple community events. Matana Roberts. Nov. 5, 2011. Quentin Moore. Nov. 5, 2011.